So many ice pops on the market these days contain food dyes and other scary additives that I make sure to avoid–if rainbow coloring dyes my kidlets’ mouths and hands rainbow colors, I shudder to imagine what those dyes do to their insides. 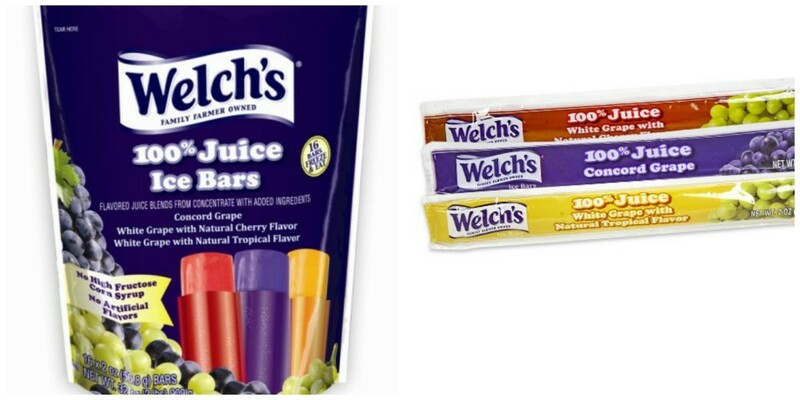 Welch’s Juice Ice Bars, manufactured by Kisko Freezies, is made from 100% fruit juice with no High Fructose Corn Syrup, artificial colors or flavors. Until I first heard of Welch’s Juice Ice Bars at MomTrends Holiday Soiree, I didn’t know that I had been missing out on such a cult favorite. It turns out that some consumers are so obsessed with this seasonably available item that they bulk order them to keep their kids (or themselves!) in frozen treats all year round. Welch’s –are you listening? !–consumer want year round availability!! Until that day, mark your calendars for Spring 2014 when your local stores will be receiving their stock. All three flavors are made from Welch’s purple Concord and white Niagara grapes, which are grown in family-owned farms across North America. Welch’s Juice Ice Bars will be available in the Spring at stores across the U.S. and Canada, including: Stew Leonards, Dairy Fresh, HEB, Demoulas, Loblaws, Sobeys, BJs, Costco, Christmas Tree Shops and Walmart. Note: Welch’s Juice Ice Bars are not certified Kosher. This entry was posted in Food and Drink, Food related, Products and tagged convenient treats, ice pops, welch's juice ice bars by jessica. Bookmark the permalink.